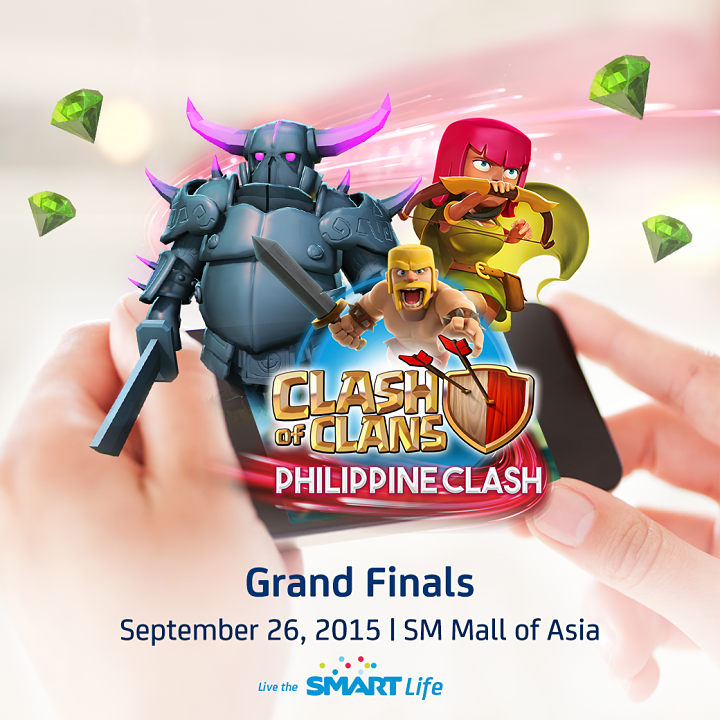 The Biggest Clash of Clans Tournament in the PH Set at SM MOA on Sept. 26 – Details Here! The country’s top Clash of Clans (CoC) teams are set to battle it out at the much anticipated grand finals of the Philippine Clash, the country’s biggest and most prestigious nationwide CoC tournament at SM Mall of Asia Music Hall on Sept. 26, Saturday, from 1 p.m. onward. The competition, mounted by unrivaled mobile services provider Smart Communications, in partnership with the Philippine eSports Organization, and Philippine Clash of Clans Battleground, SM Cyberzone, and SM Mall of Asia, offers over P2.3 million in prizes – the largest pool prize ever in a local gaming competition. A total of 107 teams joined the competition in the different parts of the country, making Smart’s Philippine Clash the country’s biggest and most prestigious CoC competition. It also set the record of the most number of teams in a live CoC competition, when a total of 30 clans showed up for the Mindanao Qualifiers at SM Lanang Premier in Davao last Sept. 5. The 10 final teams are: Pinoy Playhouse and Filipinos 24/7 of Metro Manila; Tribo Pilipinas and Pinoy Team Elite of Southern Luzon; Republica Pinas and Cebu Baby 69 of the Visayas; Davao OX Elite and Pinoy Buhawi of Mindanao; and Filipino Clan and Filipino Champs of Northern Luzon. The Philippine Clash winning team will take home a grand prize of P500,000, plus a Samsung Galaxy S6 phone and Smart Bro 4G Pocket WiFi for each of the members. On the other hand, the second and third placers will take home P300,000 and P200,000, respectively, plus a Smart Bro 4G Pocket WiFi for each of the members. Aside from the final competition of the country’s top clans, CoC fans can look forward to a whole day of exciting activities. CoC players and fans have the chance to meet Chief Pat and Galadon, two YouTube stars who have earned a following because of their passion for CoC. Both will also indulge fans with an exciting showmatch, giving everyone a peek into the top strategies for the world’s top mobile game. Fans and players can go to the event as their favorite CoC character for a chance to win P70,000 – the biggest prize for a local Cosplay contest in the country – with no other than Cosplay Queen and Gamex endorser, Alodia Gosiengfiao, as guest judge. The second and third place winners will also take home P20,000 and P10,000 cash, respectively. Aside from witnessing gaming history unfold, you can also get a chance to take home a brand new tablet, Smart Bro 4G Pocket WiFi, and tickets to Road to ULTRA–among other exciting prizes–when you register to Smart Prepaid’s Big Bytes 50 or purchase gems using Smart’s Direct Carrier Billing for Google Play at the venue. A full-packed mobile data offer, Smart Prepaid’s Big Bytes 50 comes with 350MB worth of access to mobile games like Clash of Clans and other online apps, as well as free 600MB worth of access to Fox, iFlix and Spinnr – all valid for three days for just P50. On the other hand, Smart’s Google Play carrier billing is an easy and convenient way for subscribers to buy Clash of Clans gems and other mobile content on Google Play using their prepaid load or charged to their postpaid account. and follow Smart’s official accounts on Facebook (www.facebook.com/SmartCommunications) and Twitter (@SMARTCares).